On 13 November AVO reported that a cloud of ash, resuspended by strong winds in the vicinity of Katmai and the Valley of Ten Thousand Smokes, was blown about 120 km SE over Shelikof Strait and Kodiak Island at an altitude of up to 3 km (10,000 ft) a.s.l. The ash was originally deposited during the Novarupta eruption in 1912. The Volcano Alert Level remained at Normal and the Aviation Color Code remained at Green. According to the National Weather Service, strong winds in the Katmai area on 21 September 2003 picked up old, loose volcanic ash and carried it E. Reports of minor ashfall were reported from Kodiak Island, ~ 100 km from Katmai. This phenomenon was not the result of volcanic activity and no eruption occurred. Andrea Steffke of the Geophysical Institute, University of Alaska Fairbanks, reported a relatively large ash cloud observed in satellite images coming from the Katmai area on 21 September 2003. The cloud was first seen in satellite imagery (AVHRR, GOES, and MODIS) extending ~ 69 km to the SE. The maximum temperature difference observed was -1.46°C. Dave Schneider of the Alaska Volcano Observatory reported on 22 September 2003 that at its greatest extent the cloud was detectable for ~ 400 km. It was initially observed by an overflying (high-altitude) jet, and subsequently identified in split-window images from AVHRR, MODIS, and GOES satellites. Additional pilot reports placed the cloud top at ~ 2.1 km altitude. 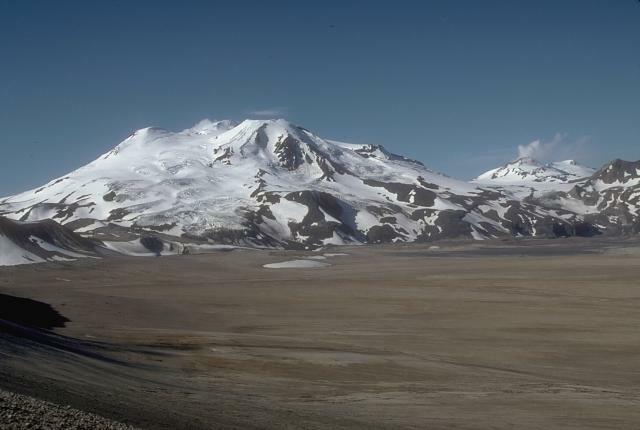 The Katmai Group of volcanoes are seismically monitored by AVO, so it was possible to quickly confirm that an eruption had not taken place. SIGMETS were issued by the Alaska Aviation Weather Unit (AAWU) for this event and an AVO Information Release was distributed that indicated that this cloud of re-suspended ash was potentially hazardous to aircraft. This event is unusual in its intensity and extent of transport. The Katmai region is characterized by frequent high winds that can be strong enough to re-suspend large (several centimeters in size) pumice fragments, yet these events typically don't produce large, extensive airborne ash clouds. Information Contacts: Alaska Volcano Observatory (AVO), a cooperative program of the U.S. Geological Survey, 4200 University Drive, Anchorage, AK 99508-4667, USA (URL: http://www.avo.alaska.edu/), the Geophysical Institute, University of Alaska, PO Box 757320, Fairbanks, AK 99775-7320, USA, and the Alaska Division of Geological and Geophysical Surveys, 794 University Ave., Suite 200, Fairbanks, AK 99709, USA. According to NASA's Earth Observatory, a Moderate Resolution Imaging Spectroradiometer (MODIS) satellite image acquired on 2 December of the Katmai area showed a plume of re-suspended ash which had been deposited during the 1912 eruption. Based on analysis of satellite imagery, pilot observations, KVERT reports, and information from AVO, the Anchorage VAAC reported that on 11 May strong winds in the Katmai area re-suspended loose ash deposited during the 1912 eruption. The Volcano Alert Level remained at Normal and the Aviation Color Code remained at Green. Based on analysis of satellite imagery and information from AVO, the Anchorage VAAC reported that on 29 November strong winds in the Katmai area picked up loose ash deposited during the 1912 eruption and carried it SE over Kodiak Island. The Volcano Alert Level remained at Normal and the Aviation Color Code remained at Green. Strong winds in the Katmai area picked up loose ash deposited during the 1912 eruption and carried it E over Kodiak Island. AVO recorded a large area of resuspended ash on satellite imagery. The National Weather Service estimated that the top of the plume was at 1.5 km (5,000 ft) a.s.l. Katmai remained at Concern Color Code Green. According to the National Weather Service, strong winds on 21 September in the Katmai area picked up old, loose volcanic ash and carried it E over Kodiak Island. AVO received reports that some of this material fell in Kodiak. This was not the result of volcanic activity and no eruption occurred. Re-suspended volcanic ash should be considered as hazardous as primary volcanic ash, and a threat to aircraft. The volcanoes in the Katmai cluster remained at Concern Color Code Green. The Global Volcanism Program has no synonyms or subfeatures listed for Novarupta. 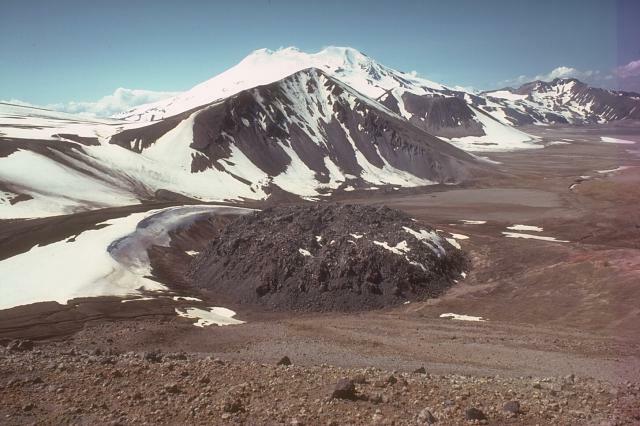 Novarupta, the least topographically prominent volcano in the Katmai area, was formed during a major eruption in 1912. This eruption was the world's largest during the 20th century and produced a voluminous rhyolitic airfall tephra and the renowned Valley of Ten Thousand Smokes (VTTS) ash flow. At the end of the eruption a small, 65-m-high, 400-m-wide lava dome grew to an elevation of 841 m within the source vent of the VTTS ashflow, a 2-km-wide area of subsidence NW of Trident volcano. The NE side of the Falling Mountain lava dome of the Trident volcanic cluster, as well as Broken Mountain and Baked Mountain, was removed by collapse of the Novarupta depression, which is marked by radial and scalloped arcuate fractures. Much larger collapse took place at Katmai volcano, 10 km to the east, where a 3 x 4 km wide caldera formed in response to magma reservoir drainage toward Novarupta. Fierstein J, Houghton B F, Wilson C J N, Hildreth W, 1997. Complexities of plinian fall deposition at vent: an example from the 1912 Novarupta eruption (Alaska). J. Volcanol. Geotherm. Res., 76: 215-227. Hildreth W, 1983. The compositionally zoned eruption of 1912 in the Valley of Ten Thousand Smokes, Katmai National Park, Alaska. J. Volcanol. Geotherm. Res., 18: 1-56. Houghton B F, Wilson C J N, Fierstein J, Hildreth W, 2004. Complex proximal deposition during the Plinian eruptions of 1912 at Novarupta, Alaska. Bull Volcanol, 66: 95-133. Remarks: Localized subsidence on the Novarupta dome is likely due to thermoelastic contraction of the dome and thick ashflow tuff. There is a gap in InSAR data coverage between 2000 and 2004, but the subsidence is likely continuous. There is no Emissions History data available for Novarupta. A 65-m-high, 380-m-wide lava dome lies within a circular ejecta ring and caps the 1912 vent of Novarupta volcano. A 60-hour-long eruption beginning on June 6, 1912, the Earth's largest eruption during the 20th century, produced The Valley of Ten Thousand Smokes ash-flow deposit, which forms the flat ground at the right. The face of Falling Mountain, behind Novarupta dome, was sheared off by a 2-km-wide collapse around the Novarupta vent. This view from the NE shows snow-capped Mageik volcano in the background. Photo by Tom Miller (U.S. Geological Survey, Alaska Volcano Observatory). Large Eruptions of Novarupta Information about large Quaternary eruptions (VEI >= 4) is cataloged in the Large Magnitude Explosive Volcanic Eruptions (LaMEVE) database of the Volcano Global Risk Identification and Analysis Project (VOGRIPA).